For the close of 2014, the discount rate used to measure obligations under defined benefit pension plans dropped back to 2012 levels, after increasing for 2013. 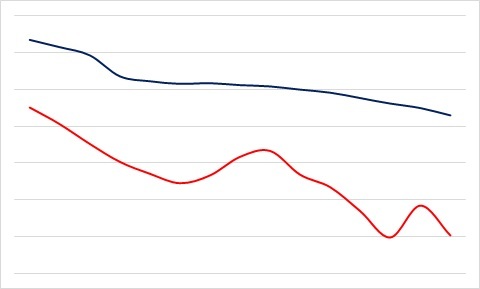 The lower red line of this chart shows average discount rates used at the close of fiscal years ending in 2000 through 2014 for the pension plans of 200 U.S. corporations with fiscal years ending in the 4th quarter of the calendar year. That drop in the discount rate for 2014 is the most significant factor in the drop in the aggregate funded ratio of pension plans, as discussed in 2014 Pension PBO Funded Ratio, since the actuarial losses arising from remeasurement of pension obligations with the lower discount rates more than offset gains experienced by the pension assets. 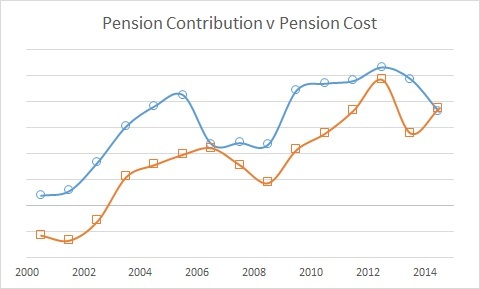 As discussed in Pension Cost — All v Traditional, the drop in discount rates is also the principal factor in the increase for 2014 in the aggregate pension costs, since the actuarial losses arising from obligation remeasurement for the small subset of employers now choosing immediate recognition of gains and losses more than offsets the decrease in pension cost that most companies were reporting for 2014. 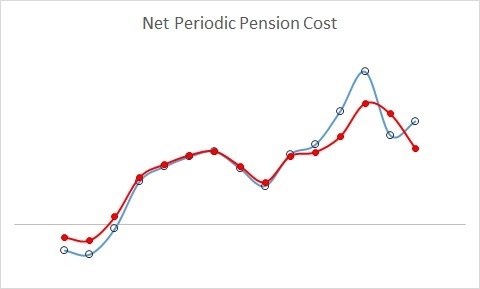 As noted in an earlier post in which employer contributions to pension plans were compared with pension costs, the trends for net periodic pension costs have been confused the past 4 years by a small subset of companies that have chosen to switch to immediate recognition of gains and losses. Previously, that subset of companies followed the traditional accounting still in use by the majority of companies, involving a deferral-disregard-spread approach to gains and losses: (1) gains and losses, including changes in measurement of obligations due to changes in interest rates, are not recognized until after the year in which the gains or losses actually arise, at the earliest; (2) cumulative gains or losses up to 10% of the greater of the value of pension assets or pension obligations are disregarded; and (3) gains or losses outside that 10% corridor are spread over the future service life of active employees (i.e., generally about 15 years). In very sharp contrast, the small subset of companies that are departing from the traditional approach recognize pension gains or losses in full in the fiscal year in which those gains or losses arise. The influence of this small subset on aggregate global trends is obvious in this graph. The blue curve with open circles represents the aggregate global pension cost for 205 of the largest U.S. companies that sponsor defined benefit pension plans for fiscal years 2000 through 2014, showing an increase in pension cost for 2014 relative to 2013 cost. This is similar to the chart that will be published by most if not all of the major pension studies; and more likely than not, none of those published studies will point out what has been the source of most of the volatility in pension cost the past 4 years. Of those 205 companies, the red curve with closed circles shows the aggregate global net periodic pension cost for the 196 companies that continue to use the traditional deferral-disregard-spread approach. If all companies had continued to use that traditional approach, pension costs would have declined in 2014 relative to 2013 costs, as seen by the trend for those 196 companies.